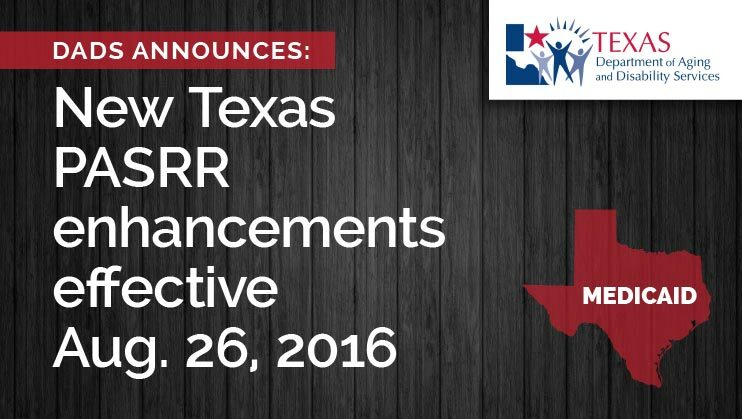 The Texas Department of Aging and Disability Services (DADS) has just release new information regarding upcoming Texas PASRR changes. The new enhancements take effect Aug. 26, 2016, and primarily affect the time allowed to perform updates to PL1 screening and IDT meeting documentation requirements. Please see the details, as provided by DADS, below. You can also download a printable version of this information. If you have questions, please contact the DADS PASRR unit (information below). Thanks to Cathy Belliveau and her team at DADS for providing this information and helping to educate Texas providers! Currently, the LTC Online Portal allows the submitter (Nursing Facilities [NFs] and Local Authorities [LAs]) of the Preadmission Screening and Resident Review (PASRR) Level 1 (PL1) to perform updates within 90 days from the date of assessment (field A0600) if a PASRR Evaluation (PE) has not yet been submitted. Effective August 26, 2016, the PL1 submitter or admitting NF will be able to update Active PL1s at all times for deceased/discharged information before and after a PE is submitted using the “Update Form” button. Additionally, the PL1 submitter will be able to update Active PL1s at all times for demographic information only before a PE is submitted using the “Update Form” button. Effective August 26, 2016, the LTC Online Portal will not allow the NF to successfully submit the Minimum Data Set (MDS) Long Term Care Medicaid Information (LTCMI) for a resident who is determined to have Mental Illness (MI), Intellectual Disability (ID), or Developmental Disability (DD) if there is no Interdisciplinary Team (IDT) meeting submitted on the LTC Online Portal within the past year. For all PL1s in Awaiting PE status where the individual is deceased or discharged…less than 90 days old and without a PE attached complete sections B0650 and B0655 to inactivate the PL1s that are no longer needed. The IDT rule to enter the form into the LTC portal has been in place for a year now. When the rule was put into place, individuals admitted prior to 7/7/2015 didn’t need an IDT entered into the portal. Because an IDT is required annually, it’s time for all PASRR Positive (Positive PE) to have an IDT submitted into the portal. If only the PL1 is positive, the IDT is not needed. This is only if the PE is positive. Check the dates of the IDTs submitted into the portal and if the date is 12 months old or older, a new IDT needs to be conducted and entered. If you haven’t conducted and entered an IDT for someone who is PASRR positive (PE positive) because they were admitted prior to 7/7/15 it’s time to do them. TAC RULE §19.2704(8) for a resident who is a Medicaid recipient, annually document in the LTC Online Portal all nursing facility specialized services, LIDDA specialized services, and LMHA specialized services currently being provided to a resident. This also applies to CHOWS, if an IDT was entered prior to a CHOW but it’s been a year since an IDT was conducted, you need to conduct a new IDT and enter it into the LTC portal (or SimpleLTC). If an individual has been identified as enrolled into Hospice, an IDT will not be required unless the individual is admitted back to NF care at which time a new PL1 would be required. After the enhancements are in effect, review all cases where a PASRR positive (PE positive) individual has passed away or discharged and enter both sections B0650 and B0655 in order to inactivate the forms. If this is not done and an IDT was not conducted because the individual passed away or discharged before an IDT was done, your LTCMI will not process. Important Note: The LA cannot confirm IDTs submitted when the Date of IDT is older than 60 days. If the IDT meeting was already held and you forgot to submit the form and 60 days or more have passed since the meeting date, you must resubmit the form with a current date and note the actual date of the meeting in the comment box on the form or conduct a new IDT. Why are these enhancements necessary? Since the rule requirement to enter the IDT went into effect (7/7/15), we’ve seen continued non-compliance by some providers. DADS PASRR continues to see 80 cases a month where the IDT has not been entered despite calls to the providers to educate and request compliance. PASRR is a Federal requirement, the discussion and delivery of PASRR specialized services is a critical piece of this requirement. Review the results, export to excel if needed. Check your census to determine if the individual is still active/admitted. If individual is discharged to hospital and is expected to return, then leave those. Please review all cases where a positive PE was submitted. Check to make sure the individual is still active/admitted. Please be careful when inactivating PL1 so that you only do so when you are sure the individuals are no longer in your facility. Please include all agreed upon services at the meeting on the IDT form when you enter it into the portal! For example: If the team agreed to OT, PT and Speech at the IDT meeting, the IDT entry on the portal must have all three listed as services. A future enhancement to be implemented may delay your LTCMI submission of the LIDDA/LMHA identifies that they were not invited or services agreed to were not included when the IDT was submitted. The LIDDA/LMHA will contact NFs to discuss and ask the NF to correct IDTs if errors are found. If the errors are not corrected, the LIDDA/LMHA will identify they did not agree on the form. Hi Deborah — Please see our PASRR FAQ, question #5. If you need more information, please contact the DADS PASRR unit at (855) 435-7180 or PASRR@dads.state.tx.us. This is the DADS directory of LA information: https://www.dads.state.tx.us/contact/la.cfm. If you need more information, please contact the DADS PASRR unit at (855) 435-7180 or PASRR@dads.state.tx.us.